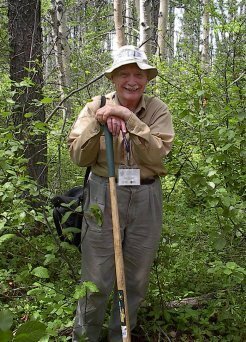 Interview with Ken Armson, Forest History Society of Ontario. This spring saw the first newsletter of the newly created Forest History Society of Ontario (see attached). For those who do not know him, Ken Armson is one of the driving forces behind this group. DB: Tell us a bit about yourself. KA: I’m a professional forester. I graduated from the University of Toronto in 1951, and did graduate work at Oxford in tree nutrition (1954-55). My working career included 26 years teaching and research in Forest Soils and Silviculture in the Faculty of Forestry, U Of T (1952-1978); 11 years with the Ontario Ministry of Natural Resources (1978-1989) and from 1989 to 2001 I acted as a consultant to provincial governments and forest industry, particularly involved with the Canadian Standards Association and development of standards for “sustainable forestry”. I have published in the fields of forest soils and silviculture including a text (Forest Soils: properties and processes, U of T Press) and 100+ refereed papers. Since 1989 I have published two books – “Ontario Forests: a historical perspective”, 2001, Fitzhenry & Whiteside, and “ The Legacy of John Waldie and Sons: a history of the Victoria Harbour Lumber Company , 2007, Dundurn. I have always been interested in history since my secondary school days in England and as a forester with an interest in soils I have had a wonderful set of opportunities to indulge in various aspects of forests and soils as sources of historical information. DB: Why a provincial society in Ontario? KA: As a long term member of the [American] Forest History Society, and knowing personally the founders of the BC and Alberta FH Associations I felt that it was about time that Ontario formed an organization. We have major changes, both actual and anticipated, in the provincial forest ministries and the forest industry with both real and anticipated losses of valuable records pertaining to Ontario’s forest history. DB: Can you give us some examples of how a history perspective was important in your career? KA: As a forester I am aware of having to assess the context and its nature of any forest I deal with. This includes three levels – the landscape, the microtopography and the forest structure itself. Of importance at each level is the nature and extent of documentation available. The first example, is when I was a graduate student at Oxford in the mid 1950’s. I had the opportunity to become familiar with the NEW FOREST in Hampshire where documentation on land use went back to 1066 A.D. Archaeologically, there were records dating back to the Bronze, Iron and Roman ages and recent pollen analyses provided a record of the forest and vegetation changes during a period of more than a thousand years. An understanding of this set of historical events was of essential importance when assessing the nature of the soils and their properties in relation to the forest and its condition. This is why there is a chapter on the New Forest in my 1977 textbook on Forest Soils. A second example is from southern Ontario in the course of my research on forest soils and tree growth, especially root development. In a study of the root development of red pine plantations in the interlobate Oak Ridges moraine I came across an “indian” midden. This led to my finding a fifty year-old report by the then provincial archaeologist who described a fortified Huron village site a few kilometers away. Subsequently I learned more about the extent of agriculture practiced by Huron, Petun and Neutral nations during the period from about 500 B.C. to 1650 A.D. in southern Ontario. With the onslaught on these nations by the Iroquois the lands reverted to forest, in many instances of pine, which when viewed by the early European settlers in the 1800’s who had to clear them became the source of the mythology of “virgin”, primeval forests. Much of these lands, first cleared by native peoples then subsequently by Europeans, was on hilly soils of sandy texture and therefore subject to wind and water erosion if exposed. The development of new forests since the 1920’s on these lands to a large degree would reflect these past histories of use and erosion. DB: Why is the preservation and promulgation of forest history important? KA: It is important because only by being knowledgeable of the history of the use and development of our forests and the landscape and soils on which they occur can we make intelligent decisions about their current and future development and uses. Too often an ignorance of past history leads to decisions which have unfortunate consequences, ecologically, socially and economically. DB: Thanks to Ken for this virtual interview. The Society is currently holding a contest to name their newsletter, and the winner will receive a a free two-year subscription to the Society! Entries are due by October 31st, 2010. The Society’s website, www.ontarioforesthistory.ca is currently under construction, but in the meantime search for them on Facebook. For more information on the Forest History Society of Ontario, contact info@ontarioforesthistory.ca.